Join Us! 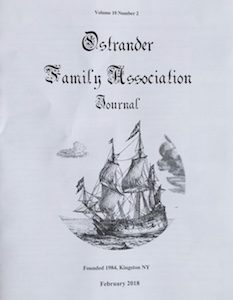 – Ostrander Family Association, Inc. Your family is important to you & you’ve spent a lot of time learning about your family tree. We know accuracy is important, and there are contradicting trees and information out there. We serve as a reliable source to support your efforts. A family reunion is held every two years; the next reunion is planned for 2019. We also support groups who want to host regional or local family reunions with materials like our family history brochure at cost. Collaborate with cousins and share information. Published three times a year: February, June and October. Mailed to your door, the old fashioned way. This publication is a mix of articles from both past and present. Interesting stories from the past and new discoveries. Members are encouraged to submit articles or even tidbits that would be of interest to the family. Click on the image to view a sample Newsletter. For those who are interested in Genetic Genealogy, we've got a community here to help you along. Click on the image to view our surname project at FTDNA. We use a membership management program called Wild Apricot that allows you to pay for your membership online. You also have the option to complete a form and mail a check the old fashioned way. Annual dues are $20.00 (USD) per year. or by adjusting for the exchange rate when paying with C$ checks. Click the button above to register directly through our Wild Apricot membership management system. *Please make the check payable to: The Ostrander Family Association. Please print and complete the Membership Application and mail it to the address noted on the form.